If you’ve started a DIY project at your home but realized halfway through that the job’s just too big for you to handle? An article in the Daily Mail shows that you are not alone in this. A poll by RatedPeople.com found that of 3,200 people surveyed, around two-thirds, or more than 2,000 were living in the midst of a chaotic DIY project gone wrong. Many people in Britain fall victim to an unfinished home project that causes strife in the home. DIY projects that have been started go wrong for many reasons – the project ends up getting bigger and bigger until your modest DIY skills are unable to handle the job. Or your life becomes so busy that you’re unable to finish the job. May be you’ve run out of finances – so many people find themselves in this situation. The most common problem is with kitchen or bathrooms that never seem to be completed. Kitchens can be left half-fitted or you may paint half a room but leave the other walls unfinished. After all, if you have children running around and putting tiny fingerprints all over the walls you may wonder – what’s the use of finishing it anyway? This problem can lead to a lowered quality of living, as well as rows as you work out how to put your property back together. The research found that a staggering 61% of people in Britain – or 14m households are going through this. And it is affecting their health too, as property owners suffer anxiety and insomnia due to the problem. Because of half-finished DIY projects, some households are reluctant to have guests into the home. The main issues that prevents people from completing their projects are a lack of finance or time; a lack of skills or disputes with their neighbours over their planned changes to the property. For some people, these problems push the completion of a project back from three to six months. But for others, it takes up to three years to get your DIY project completed. Hiring a painter and decorator, builder or roofer may prove to be less expensive than you think, especially if you’ve started a project and made a huge mess of it. Calling in a professional roofer, for example, can prevent a small leak from causing major structural problems that could cost you dearly to repair in the future. There’s safety to think about too. A professional tradesman can finish a project quickly and efficiently and there’s less chance of you hammering a nail through your finger while you’re tackling difficult DIY projects. It will also save you the worry of wondering if your skills are up to the job, because there’s nothing worse than thinking you’ve put up the perfect kitchen cupboard only to find that it falls down again later. And even worse than that, it takes half the plaster with it! So getting in the professionals can serve to save you cash in the long-run. Take the worry out of looking after your home with professional roofing and general repair work from G&A Roofing and Building. G&A Roofing and Building is a leading roofing firm that provides a vast range of roofing and home maintenance services for all types of properties. We offer affordable prices and professional solutions to deal with problems such as cracked gutter, leaking roofs and chimney damage. 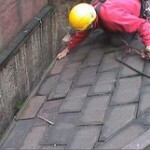 We also offer emergency roof repairs. Call a trained roofer to find out how we can help you take care of your property on 0800 626430.